No, don’t worry–I haven’t mastered it. But, you know who has? A woman named Gianaclis Caldwell. She has a Nigerian Dwarf goat farm and farmstead cheese operation up in Oregon, called Pholia Farm. She wrote a DIY book about starting a creamery, and she makes some dank-yum cheeses. Now Caldwell has an excellent book out called Mastering Artisan Cheesemaking. You might be surprised to hear I once took classes at the Vermont Institute of Artisan Cheesemaking. When I was five months pregnant, I suddenly panicked that I would never have the chance to learn from the pros how to make cheese once the bambino came along. I imagined that I would sink into a deep depression because I had no time to study the art and science of cheesemaking post-baby; that I would yearn for what I hadn’t done. I was actually right–I won’t be able to take a two week-long class in Vermont for the next, oh, 10 years–so it was good to get it out of my system. I did love Vermont–and I loved classes there. We made huge f-ing vats of gouda and stabilized soft cheeses. We learned about the science of how milk becomes cheese, how the molecules are interacting during the setting process; about different kinds of rennet; about pH, and how that makes a cheese behave a certain way. And, I also learned that I would never be a professional cheesemaker. I’m not sanitary enough for bulk production, and I’m easily bored with repetitive tasks. But I do love making cheese at home. 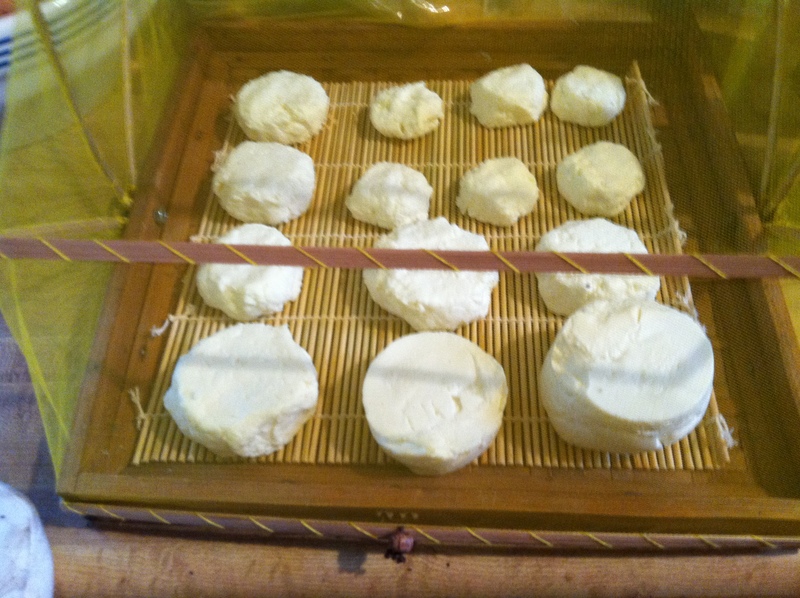 In the past I’ve used New England Cheesemaking direct set kits–little packets which include the cultures and some rennet; but after cheese school, I started buying culture and rennet separately, and being a bit more experimental with it. If it turns out funky (sorry mom, about that cat hair fig leaf number I sent you last autumn), I can just throw it out. If it’s good, I can share it with friends and feel a little god-like. So I don’t regret spending the time and money to go to Vermont. It turns out, though, that I didn’t have to go to cheese school at all, because Caldwell’s book covers all the stuff I learned in class. I’m offering a galley copy of the book to a reader who posts the best comment about why they would like to read the book. One of the sidebars in the book is about making rennet out of cardoons. I happen to have a lot of cardoons (they are pretty but weedy), so I was eager to try making my own vegetarian rennet (I once made my own rennet from a goat’s stomach, and it took forever…). 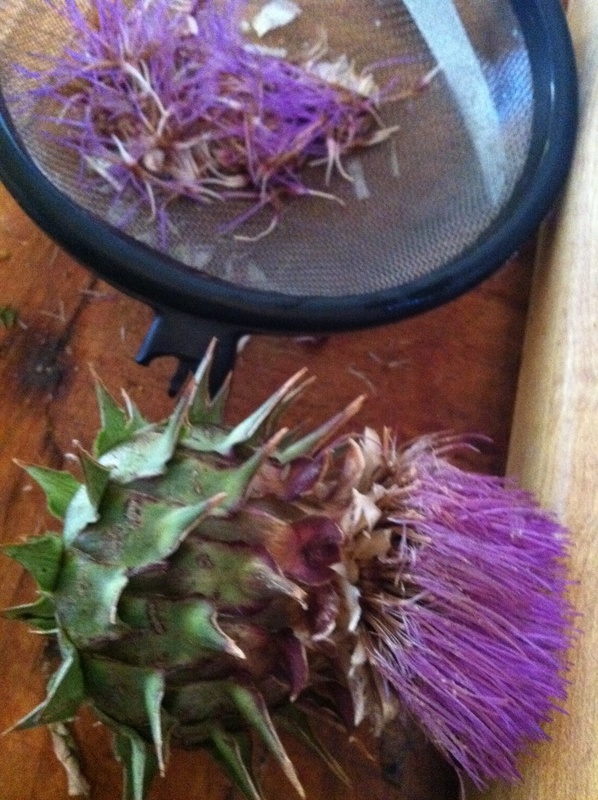 First I picked the cardoons when they had bloomed and were purple. Then I sat around and pulled out the stamens. As directed, I tried to dry the stamens then grind them up, but they wouldn’t grind. So I just soaked them in water water for 30 minutes, then decanted the liquid and put it in a jar, ready for cheesemaking. Except then someone thought it was just a jar of dirty water and poured it down the sink. Undaunted, I picked more stamens and soaked them in water. While that happened, I heated up the milk as Caldwell directed, to make chevre. Then Franny kicked the container of the second batch of cardoon water over. So I used rennet I had in the fridge, and the tailings of the cardoon water. Maybe it’s the book, maybe it was the small amount of cardoon–but this cheese turned out better than any I’ve ever made. It’s super creamy and yum. I innoculated with some geotrichium, so the ones allowed to age will form a nice bloomy rind. Thanks Gianaclis!! And to D’s goats who provided the milk. This entry was posted in cheesemaking. Bookmark the permalink. I want to make my own cheese! I’ve heard it’s the culinary equivalent of building a log cabin and that homemade cheese is a big hit at dinner parties. We have a monthly bunco group and I’ve made deviled eggs from my very own chickens and think it would be way fun to try the cheese thing too! I live in the city – only allowed 2 chickens – no goat either but a friend an hour and a half drive away, in the country, has goats and I could use her milk! I would love that book. Why? because you are awesome, I have 2 goats( one who just came through a hysterical pregnancy. ( we were hysterical, not her) and most of all you have inspired us to become urban farmers,. I was sad to read that a lock was going up on the gate, but know that you have a bunch of people out here that are trying new things because you were brave enough to try them first. Thanks. I would love to read this book. I lived in Naples, Italy for three years and loved the buffala mozzarella there. Alas, no buffalas here but i might be able to make my own fresh mozzarella someday, which would be really fun. It’s expensive in the stores here! I would like to read the book because my life just isn’t cheesy enough. Seriously. I can’t get enough of the stuff. I will never get around to reading the book, but I hope somebody up here in Boise has and is selling their cheese at a farmers’ market. We seem to have an ample supply of goats in this area for cheesemaking. I would love to have this book because I think that I would use it a lot. I am doing my eighth grade project on cheeses and want to get started as early as possible. I am going to make my first cheese, Queso Blanco, today and I would love it if I had a great book to guide me in the rest of my cheese making future. In short, I am a thirteen year old girl who is just beginning to figure out the wonders of cheeses. I also have read your books, Farm City and The Essential Urban farmer, from cover to cover at least three times. I think that if I had this book it would help me start a project that could become a life long hobby and a devotion to homemade cheeses. There are NO “four food groups”. There is only cheese. Please may I have the book? Hi Novella. I don’t know if it is too late to give a shout out for the book. I have a dear friend that has a small farm and raises goats among her all creatures great and small. She makes cheeses and soaps from the milk and it helps feed her family of eight children. Yes, I said eight. She has my admiration for many reasons, as do you. I have been meaning to get to the farm to help and learn a bit from her and reading your book would help me to feel like less of a moron about the process. You would enjoy meeting her. Her name is Maureen and she has a blog Tasha’s Own. She learned goat keeping from the children’s author/illustrator and has the grace of her mentor Tasha Tudor. I commented before about reasons I would love this book but this time I am just posting because I did something that I thought you would be interested in. Last night I made cheese for the first time. It was a mild salty cheese made from milk and cider vinegar. Its called Queso Blanco. We only got a taste of it last night but we have thirteen chickens so we are going to use it in omelets for dinner tonight. I made yogurt and paneer this weekend and would love to move on to something a bit more involved with cultures, rennet and other cheese trickery. I am trying to pull a Novella and buy the lot nextdoor which would become goat central which would recquire a good cheesemaking book! Yogurt or yoghurt (US /ˈjoʊɡərt/ or UK /ˈjɒɡərt/; other spellings listed below) is a dairy product produced by bacterial fermentation of milk. The bacteria used to make yogurt are known as “yogurt cultures”. Fermentation of lactose by these bacteria produces lactic acid, which acts on milk protein to give yogurt its texture and its characteristic tang. Worldwide, cow’s milk is most commonly used to make yogurt, but milk from water buffalo, goats, ewes, mares, camels, and yaks is also used in various parts of the world. Dairy yogurt is produced using a culture of Lactobacillus delbrueckii subsp. bulgaricus and Streptococcus salivarius subsp. thermophilus bacteria. In addition, other lactobacilli and bifidobacteria are also sometimes added during or after culturing yogurt. By food law, some countries require a certain amount of colony forming units of microorganisms to allow sour milk be named as “yogurt”, e.g., Swiss Food Law: Article 56 yogurt 2 The final product must contain a total of at least 10 million colony forming units of microorganisms under paragraph 1 or 1.2 per gram. Really….. you copied that off of wikipidea. I’m not posting to ask for the book, I’m posting to cast a vote for Eliza getting it. How wonderful that a 13 year old has such interests and is already making cheese. Even if she doesn’t win, she is totally awesome. I hope to one day make my own cheese, and I need this book because I don’t know what the he— you are talking about with some of those words, and I don’t have the time or money to go to Vermont for a class. I innoculated with some geotrichium (huh?)! I picked up your book as a teenager in community college in California, where I was studying sustainable ag but have since dropped out to pursue knowledge the old fashioned way.. As I type this I’m living in a dilapidated old farmhouse on an organic farm in the middle of rural Vermont where I’m living and learning how to grow food. It was your radical story that inspired me! I was working on a dairy farm last year in South America, making cow and goat’s milk cheeses, and I’m hooked! I raise bees for honey and my next project is to get some goats and start some crazy cheese projects. I can’t afford cheese school, so this awesome book would be a big help. Thanks for all the inspiration nonetheless. You’re a hero to us young female farmers. Novella, I love cheese, but what I love more is your visit to our Edible Schoolyard! Thank you so much for coming–it was so much fun and everyone was blown away by you!!!! Congrats to Eliza! 🙂 Happy Cheese making! Oh … pick me, pick me, pick me!! I’m in Santa Cruz County, just down the hillside from Love Apple Farm. You and the fam can come on over for the day and see my teeny-tiny, tenny-weiny farm in a trailer park with two chickens. And then you can check out Love Apple Farm and see a proper outfit. That’s it. I just wanted to say thank you one more time. I am SO excited to read the book. I also wanted to say thanks to Nancy R. for posting such a supporting comment. I just got the book! Thank you, thank you, THANK YOU! Mario Batali has a good recipe for a cardoon gratin, but mine were far too gone pithy and stringy to be very good.